Tom Carroll is the latest player in the spotlight as he takes part in our ‘One on One’ interview feature series. Q] What do you prefer – being a No.6 or a No.8? A] That’s a tough question. I like playing both positions to be fair. But sometimes I prefer playing the deeper one to get on the ball more and get the team playing. 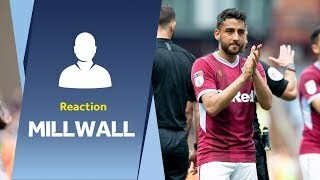 Q] Aston Villa – your thoughts? A] It’s as good as I hoped it would be. It’s a massive club. I know that gets said a lot – but it really is. It’s got everything it needs to be a Premier League club. When the call came in, it was very hard to turn down. The opportunity to play for this club was huge. Obviously results hadn’t been good of late but after the win at Derby County, let’s have a late go for it. Q] What was your first replica kit? A] Southampton was my first club. My old man was a Southampton fan. He loved Le Tiss. He got me watching him and the Saints. They were my first kit. Q] Talk to us about your fellow January signings – Lovre Kalinic, Kortney Hause and Tyrone Mings? A] Lovre is a good character. He’s a big monster. He’s a great guy in the dressing room – and a commanding presence out there on the pitch. I’m sure he’ll only improve, too. I sit near Kortney in the dressing room. He’s a top lad. He’s getting better and better in every game so far. Tyrone is a leader – a big character and huge presence at the back. He’s done very well. He’s been commanding at the back and he even chipped in with a goal at the other end too when we came back against Sheffield United. 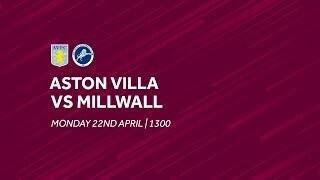 Q] How much are you looking forward to the Birmingham City game? A] It’s going to be a massive occasion – a match that, as a footballer, you relish being involved in. I can’t wait. I know it’s the talk of the city before, during and after the match. We had a good result at Villa Park earlier in the season but they’ve had a good run and are flying high in the table. For the derby element and where the two clubs are in the table, it’s clearly an exciting, big game to look forward to. Q] You played with our former goalkeeper Brad Friedel at Tottenham – talk to us about him? A] He was a top, top man. I played with him and trained with him a lot.I know it was towards the end of his career but he still oozed quality and class. His shot-stopping was unbelievable. He was a consummate pro too. You could talk to him, as a youngish pro myself, he was always there if you needed help or advice. You can’t underestimate lads like Brad in a dressing room. I have nothing but great words for him. Q] Surprised that your former manager Harry Redknapp became King of the Jungle? A] I was surprised he went in, definitely! But, once he was in there, I thought he came across very well. You probably saw a side of him that you don’t get to see in the world of football management – other than behind the scenes – because it’s such a serious business. Harry is full of jokes and gags. He was a great manager – but a great character too. Q] Gareth Bale, Harry Kane, Luka Modric – best you’ve played with? A] I absolutely loved training with Luka Modric. He was the man! In training, he was ridiculous – absolutely incredible. You couldn’t get near him. Watching him, I always knew he was going to go on and become one of the best in the world. The way he saw things that others didn’t really struck me. You’d try things like ‘oh I’ve got him on his left foot now’ and then he’d hit a stunning pass with the outside of the right foot into pinpoint position. Q] Tim Sherwood was your manager at Tottenham – how good was he? A] I really enjoyed working with Tim. He was one of the biggest influences on me in my career to date. He was my U23 manager at Tottenham. We had a great team at the time and played some really good football. I know some of the lads who played with him at Aston Villa and they said they enjoyed it with him, which doesn’t surprise me. He was a good character, a big personality – and I hope he’s back in a job soon. I think football needs characters like him. Q] Best character in the dressing room? He’s involved in a lot of the stuff. He’s a loud character in the dressing room and, from what I’ve seen of him, he’s a top player too. I’ve seen quite a few of the games and he’s a strong lad out there, battling for absolutely everything. He leaves everything out there on the pitch. He’s a top lad and he’s welcomed me into the club really well, which I very much appreciate. 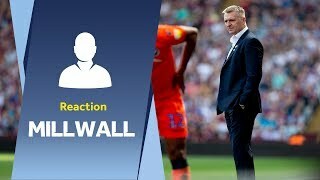 Q] How important to get Jack Grealish back? A] I’ve not spent much time with Jack because I’ve not been here a great deal of time but you just know he’s got real quality. That’s the feel you get within the club – and also on the outside too when I wasn’t here, you always got the feeling he was a vital piece in the jigsaw here. It was a good moment to see him back in full training – and obviously seeing his performance against Derby. Not a bad goal to top it off, either!